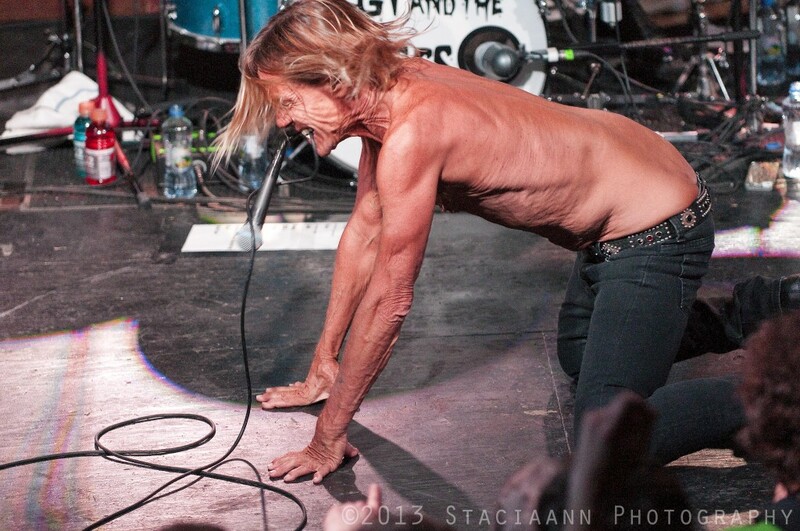 Iggy and the Stooges at SXSW. Courtesy Staciaann Photography 2013. Was SXSW really a week ago already? It’s my first time attempting to get a sense of the happenings in Austin down in writing, so bear with me here. Blogging about things as they happened didn’t pan out; turns out, I needed some time to fully absorb the vibe from this year’s festival (and to expunge whatever this sickness is that waylaid me toward the end of this week). It’s likely you’ve seen, heard, and read some SXSW footage already; you’ve probably seen festival coverage featuring the young buzz bands and artists who’ve been household names in the last 50 years of popular music who turned out, like Stevie Nicks, Green Day, Depeche Mode, Iggy and the Stooges, Justin Timberlake, and Snoop Dogg (er, Snoop Lion). Predictably, hordes of people once again flocked to sunny Austin, Texas to take it all in. And there must be hundreds of articles at this point about the state of the festival itself, both from writers bemoaning the changes in SXSW over the years and those responding to their complaints. The truth is, like anything else, when you’re on the ground and in the middle of it all, there are both good and bad elements in a sprawling event like this. And during SXSW, those good and bad moments collide with each other at a pace that’s hard to keep track of. So, I’ll keep it short and you can follow the hyperlinked crumbs I leave here to dig deeper for yourselves, if you like. You entered the ticket drawing for a chance to see Nick Cave and the Bad Seeds, Alt-J, Yeah Yeah Yeahs and Cafe Tacvba. Unfortunately, you didn’t win a ticket to this show. Demand for the drawing has been incredible but there is a limited capacity. Luckily, there’s still lots to do tonight at SXSW. Seriously? Here’s one of the artists I’ve been most looking forward to seeing, and I’m already shut out? Why did I even get this silly looking thing? Scottish DJs Optimo at the Haven. Photo courtesy of the author. The music portion of the festival hadn’t even “officially” begun but, of course, the email was right on: Nick Cave might be out of the picture, but there were a ton of options still available. 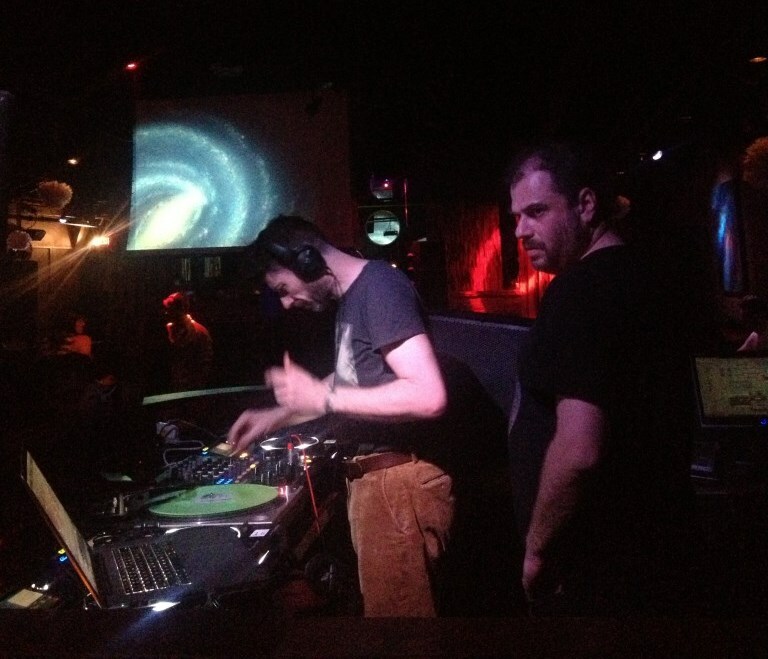 So, later that evening, I took in a transcendent early evening set by Scottish DJ duo, Optimo — it was a rare opportunity to see two artists who greatly influenced the way I have DJ-ed in the last few years. At SXSW, you take the good with the bad. With a long wait in line plus no guarantee of actually hearing Nick Cave in my future, I made a decision to forgo seeing a lot of music on the first day of SXSW to stand in a different line. I decided to see another band on my bucket list: Iggy and the Stooges. Standing in the sun for two hours isn’t my (or anyone’s) idea of fun, but all that was forgotten when Iggy took the small outdoor venue’s stage with a Stooges lineup that included Mike Watt on bass and Steve Mackay on sax. Their set was filled with all of the songs you want to hear: “Funhouse”, “Search and Destroy” and “I Wanna Be Your Dog,” plus a few new songs I’m not sure I need to hear again. The highs and lows collided once again. 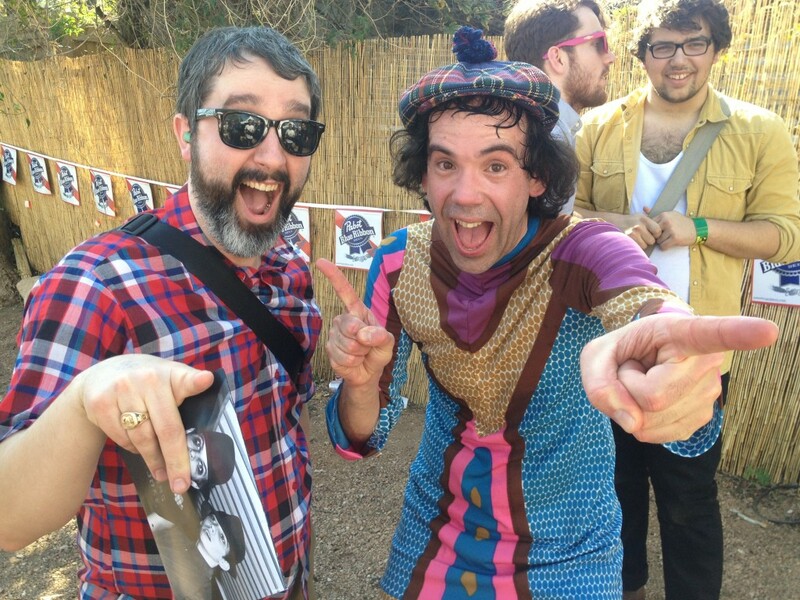 Nardwuar and the author. 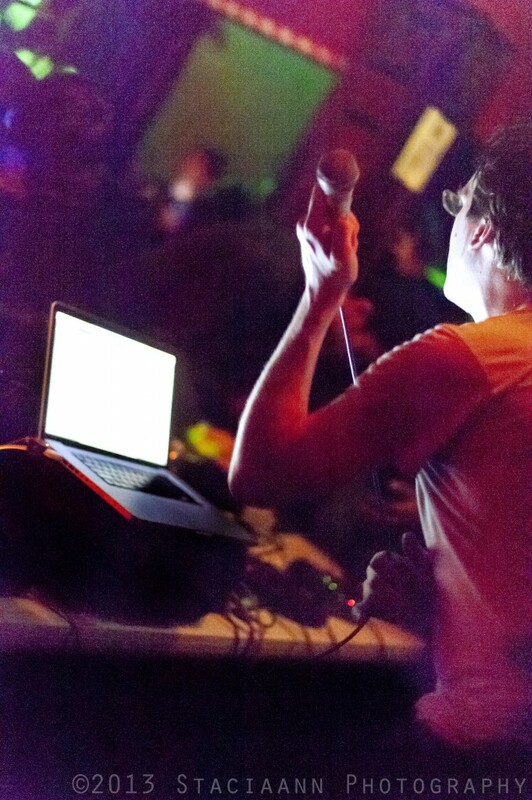 Photo courtesy of Tom Loftus. These moments during my first two days in Austin encapsulate the overall experience of SXSW for me this year. As expected, I consumed heavy amounts of live music in less than a week’s time (find my highlights and lowlights from those experiences listed below). I always come in to SXSW trying to figure out if the festival is still worth the trek and effort, especially considering just how much we already have going on in the Twin Cities. As I do every year, I spent hours in preparation poring over schedules and researching bands, so I could maximize my time in Austin. And then, as usual, I proceeded mostly to ignore those careful lists of shows, going with the flow instead. So, was it worth driving through two blizzards to get to and from Austin this year? Could I have seen just as many shows staying at home in the frigid Twin Cities? Was that Stooges set one of the best things I have ever seen in my life? Do I feel like a lot of what SXSW represents is the antithesis of what is good in music discovery? Yes, to all these questions. I am still conflicted. But as of right now, I’m also still planning on driving down again next March. The Soft Moon and Austra at Elysium to finish off my SXSW on Saturday. First time seeing The Soft Moon and I have listened to their Zeroes album at least 10 times while writing this piece. 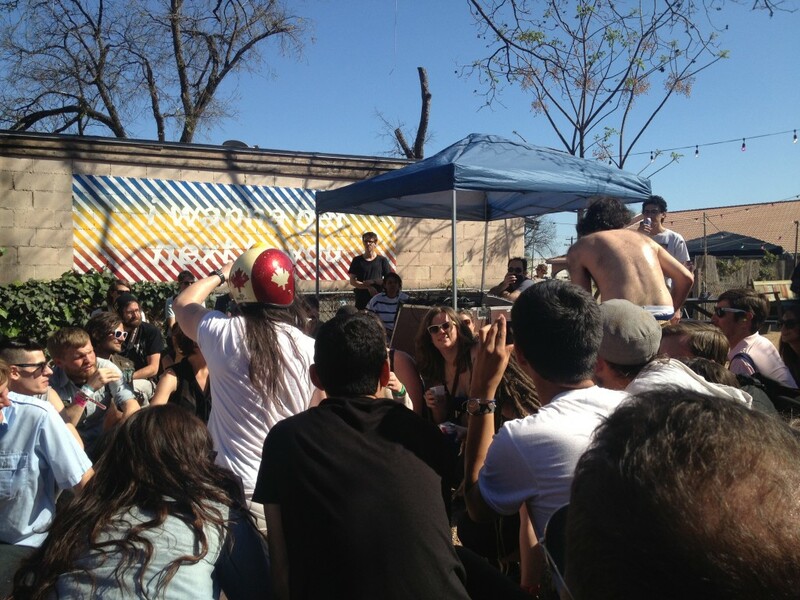 Nardwuar (shirtless) and Andrew WK (Candian motorcycle helmet) with crowd at Riot Act / Mint Records Day Party. Photo courtesy of the author. Andrew WK and Nardwuar‘s joyous and playful set that involved crowd participation. Be on the lookout for footage of me and some other guy carrying Nardwuar arnound throughout an entire song. Minnesota Migration will recount the musical adventures and musings of Tom Loftus as he travels outside of the Minnesota borders for new and interesting sounds.